My suspicion is that they were starting to see the underlying problem of the vacuum filler, the ease of over-stressing the tail seals, as a growing frequency of warranty claims, and they wanted to ditch it before they turned into the Sheaffer Pen Repairs Only company. The alternative, the lever, still had all the small issues which had spurred the drive in the 1930s to offer an alternative; a slightly clunky-to-use mechanism that relied upon the interface of a possibly sharp-edged metal bar and a fluid-filled rubber sac. The solution to this dilemma turns out to offer most of the best aspects of both systems, as Touchdown fillers are as easy to use as vacuum pens but don’t fill a pocket with ink if a the tail seal fails, and are as reliable and easily repaired as the lever fillers. There is still a rubber sac at the base of the mechanism, but no moving part ever touches it and rupture is extremely unlikely. 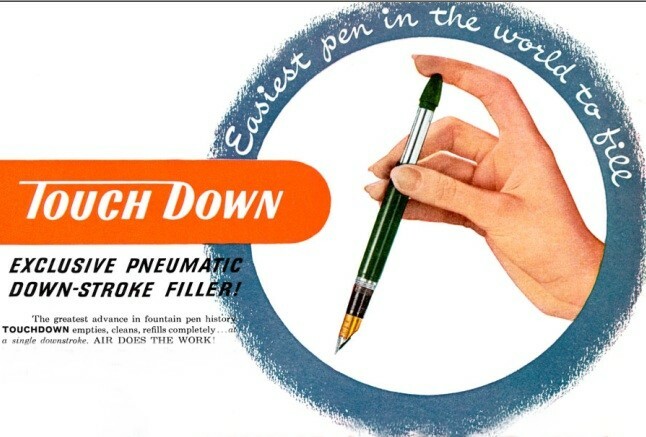 Pneumatic fillers were not a new idea by any means, but the way this one was rigged made it by far the most convenient possible, and for a pen maker looking at the growing shadow of ball-points, convenience would be an extremely attractive attribute. This mechanism, brought into production in 1949, was used by Sheaffer in one form or another without a break until at least the 1970s.